The photos show a staple, the top of the fleece, the dirtiest part of the fleece up close and the underside. Shetlands are not big fleeces and they're pretty easy to process. 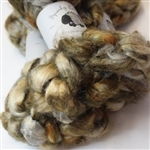 A Shetland fleece was the first fleece I had ever processed through and I personally think it makes a great beginner fleece. It's not got too much lanolin and it's a good length. My sheep are not coated but the Shetlands manage to stay cleaner than the rest. The photos show a staple, the top of the fleece, and the underside. CVM is an amazing breed of sheep with a delightful wool. If you want to know more about the breed click through HERE. No sheep is coated so no fleece is 100% without VM but we skirted well and the fleeces always clean up quite lovely. Photos: Locks, the messiest part, the whole fleece, and look at that crimp! Photos: Underside, underside, locks, outer fleece CVM is an amazing breed of sheep with a delightful wool. If you want to know more about the breed click through HERE. No sheep is coated so no fleece is 100% without VM but we skirted well and the fleeces always clean up quite lovely. This is an amazing wool. It's a sheep breed created here in the USA. It's a soft and squishy fiber that is a really incredible spin. So much life and sproing. Its very similar to it's non sw cousin. It's still crazy sproingy but this one is less likely to felt up on you when you give it a hard wash.